A 9 yo girl is brought into the emergency department, following an episode of syncope. She has a current viral illness and looks miserable. She was walking into the Emergency Department with her mother, when she collapsed. She recovered quickly with no post ictal component but also had no memory of the event, although the event was preceded by ‘dizziness’ and diaphoresis. Her past medical history is ADHD, for which she is on no medication. You review her in the triage room as the department is filled to capacity. The vitals are all normal but the child looks tired and has some coryza symptoms. You ask the resident to get the rest of the story and show you an ECG. The resident brings you the ECG. 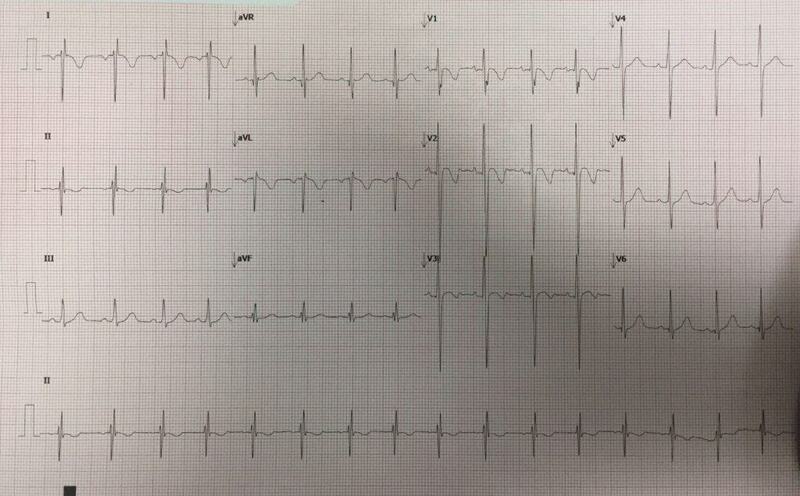 What is your comment on this ECG? At first glance: There is T wave inversion in anterior leads but you would expect this in a young girl. 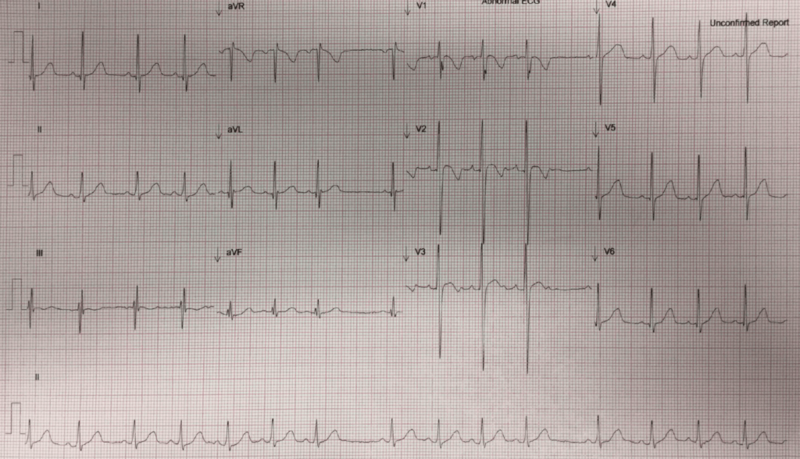 There are however T waves inverted in the lateral leads…….STOP. Let’s go over the ECG in a systematic fashion. Is it sinus rhythm? For it to be sinus, the p wave in II must be upright and the p wave in aVR inverted. This is not the case. Now look at lead I, The p waves are inverted and they should be upright. So this ECG is the result of limb lead reversal. You have the ECG redone. The ECG is shown below. How would you comment on this? Is it sinus? YES- p waves inverted in aVR and upright in II. The QRS complexes show a RIGHT to LEFT Heart predominance transition, which is expected. There are no ischaemic or other ST changes and the T wave inversions in the anterior leads are normal for this age group, although you would expect them to be flipping back upward at about this age. There are some U waves to be seen in the anterior leads, which may suggest hypokalaemia. The Intervals show a normal PR interval, however the QT interval looks prolonged and when the QTc is measured, it is 480ms. There is variability in what we consider a normal QTc, however in children above 6 months old an upper limit of QTc is 460ms. Prolonged QT can lead to Torsades de Pointes, also known as Polymorphic Ventricular Tachycardia. This is usually a self terminating arrhythmia, but can recur. The result may be a loss of consciousness, or even seizure-like activity due to haemo-dynamic compromise. It can occur repeatedly, or for a single episode. Why do we correct the QT? Corrected QT gives us the QT interval at a heart rate of 60 beats per minute. This allows comparison over time at various heart rates. What are the potential causes of a long QT? This can have an insidious onset and can be viral or bacterial. It is usually associated with a recent viral illness and it can result in very sick children. The presentation originally may be with ECG changes, but this can progress to heart failure and long term sequelae of dilated cardiomyopathy. ADHD medications can prolong QT. We discussed the case with the local paediatrics service for admission and monitoring. The Tertiary Paediatric Cardiology service was involved in this case and they were happy for the child to be monitored in the emergency department for some time and then discharged, for outpatient holder monitor and ECHO. Yeah, I got the LQTS, but what’s up with the dropped beat? In the long II trace, there are 7 regular QRS preceded with a P wave, then nothing. Then another 4 beats, and again.. nothing. In a syncope kid, I am more worried about a Mobitz II for no good reason, along with the QT. This pauses are longer than what I would expect from respiratory variation. Comments ?? Good to see you looking at it objectively. It isn’t a Mobitz block, as the basic requirement for it to be a Mobitz block is that the P-P interval must be regular in the background and a beat missed ie., there is a P wave but no corresponding QRS that comes from that p-wave. If you plot the P-waves in this ECG, there is no p wave that doesn’t have a corresponding QRS and due to the P-P intervals there is no P-wave hidden.